Ratatouille is my most favorite dinner. 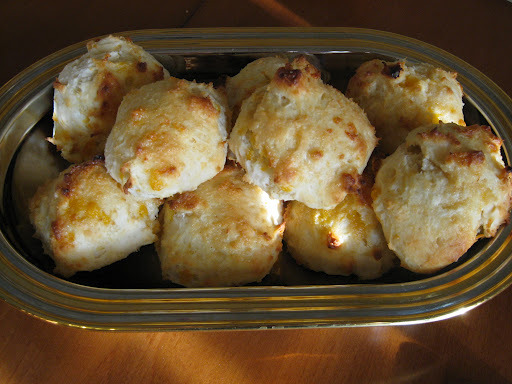 I always make the recipe from my Moosewood Cookbook, but today I thought I’d try it on the BBQ. It turned out wonderful and I loved the fresh basil in this recipe taken from The New Vegetarian Grill by Andrea Chesman. 1. Prepare a medium-hot fire in the grill. 2. Skewer the onion and garlic. Brush the olive oil on the onion, garlic, eggplant, pepper, tomatoes, and zucchini. 3. 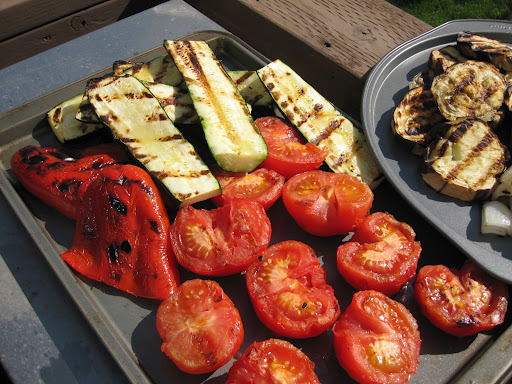 Grill the vegetables, turning occasionally, until tender and grill-marked, 10 to 15 minutes for the eggplant, onion, and garlic; about 10 minutes for the pepper and tomatoes; and 5 to 8 minutes for the zucchini. Remove the vegetables from the grill as they are done. 4. Chop the grilled vegetables into 1/2-inch dice and combine in a saucepan with the basil, oregano, thyme, bay leaf, and salt and pepper to taste. Simmer for 15 minutes on the grill or on the stove. Taste and adjust the seasonings. Serve hot or at room temperature. I love this recipe, especially now with all the strawberries in the stores. A friend of mine gave me this recipe so I’m unsure as to what cookbook it came from. I always half the recipe for the dressing so I have included the full and half versions. 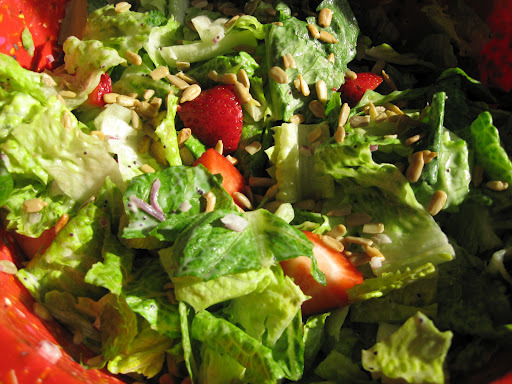 Use with romaine lettuce, red onion, strawberries and sunflower seeds.